We were in for a real treat today. We had Dr Richard Harvey as our speaker. He is a Jew who believes in the death and resurrection of Jesus Christ. He was with us today and shared with us a delightful message of Christ in the Passover. 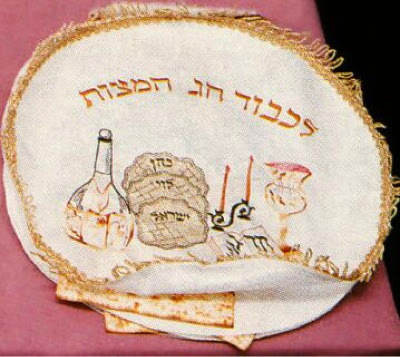 He introduced to us the Passover meal that is observed by Jews every year during the Festival of the Unleavened Bread. 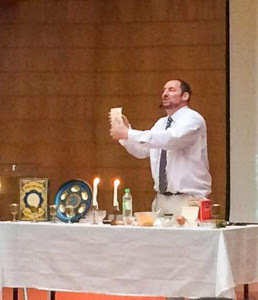 He showed us the items involved in the meal: the hyssop or parsley leaves in salty water, bitter herbs, the Haggadah, etc. but what intrigued me most were the matzah tosh and the afikomen, and the four cups of the Passover. I never knew about them and I am amazed at their significance in light of Jesus. 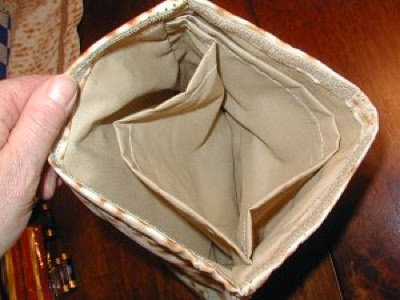 The matzah tosh is a bag with three parallel pockets to place the matzah or unleavened bread in. 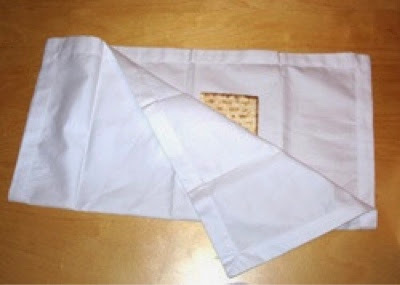 The matzah from the middle pocket will be taken out, broken and wrapped in a cloth and subsequently hidden. That is the afikomen. It will be brought back at the end of the meal to be distributed and eaten as the final morsel. Dr Harvey said that this is significant because the three pockets could very well signify the Triune God. The bread taken from the middle pocket (of the Son) will be broken (will die), hidden (buried) and brought back (resurrected) to be given to be eaten (partaken). He said that during Jesus and the disciples' Last Supper, it was the afikomen that was broken and distributed, "take, eat, this is my body" (Matt 26:26b, ESV). 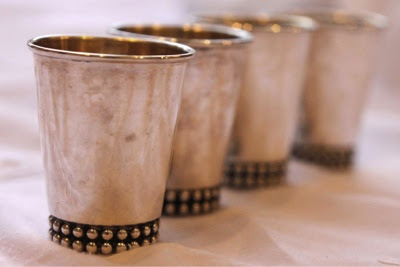 The four cups, they commemorate the deliverance of Jews from the Egyptians in the time of Moses. They consist of the Cup of Sanctification, Cup of Deliverance, Cup of Redemption and Cup of Praise. After which, when it came to the fourth cup, the Cup of Praise or Restoration, Dr Harvey believed that Jesus and the disciples did not drink from it because Jesus said, "I tell you, I will not drink from this fruit of the vine from now on until that day when I drink it new with you in my Father's kingdom" (Matt 26:29, NIV). I was quite amazed. But I began to also wonder where and when did the matzah tosh, afikomen and the four cups come about. As far as I can remember, they are not mentioned in the bible, not in Old Testament and definitely not in the New. Noel, who happened--or divinely arranged--to attend the same service today, asked me the same question, if these items were mentioned in Scripture. I said and he agreed: if they were mentioned in the bible, Christian scholars would have already picked it up and we would have already known about it. These items and what they stand for are significant. So my take is that the bible as we have it, is sufficient by God's design for our understanding, for the Gentiles. For the Jews on the other hand, they have their practices since the OT days, which were, and are, special for them, since the gospel is after all, first for them. The Jews have indeed, a richer and fuller background and history of the salvation and deliverance of the Messiah. It is my prayer that they will come to find Jesus as their long awaited Saviour. As for me, I am blessed with a deeper understanding of Jesus' Last Passover, and the significance of what he said to the disciples, and of what he says to me. I eat of the bread of life, broken, hidden and brought back. I drink of the Cup of Redemption, being redeemed back into his fold. And I look forward to drink of the Cup of Praise, Restoration and Joy with Jesus when I am finally in the Father's kingdom. Amen. (Here's the link to the sermon: Christ in the Passover). The thing that I love the most about the seder is how it is a meal that is shared with the ones who we love. It is in stark contrast to many religious communion services where people line up to get a morsel of bread and a sip of wine. I have not experienced the seder before. Have not met a Jew before this! But I agree. My OT lecturer used to say that the Jewish practices are more "real" compared to our reduced and sanitized versions. He got us to imagine the aroma, the noise and feel of the environment when sacrifices were being made and lamb being roasted :) And yea, we line up for a morsel of not even bread but manufactured wafer and diluted grape juice :) We need to re-look into the smell, taste, feel and experience of the bread and wine. "Jewish practices are more "real" compared to our reduced and sanitized versions"
:) That is nice. I am going for a seder meal tomorrow being Good Friday. Looking forwards to it!